Jammu and Kashmir , Ladakh the most loved destinations in India, it still remains the most visited place by domestic & international tourists. Recently a press conference was held in Ahmedabad inviting tourists from Gujarat realizing religious significance to Vasihnodevi in Jammu and beautiful tourists destinations covering Kashmir valley, picturesque gardens, Dal lake, houseboats, Gulmarg, Pehalgaon and beauty of Ladakh. J&K Travel Trade stake holders including hoteliers, house boat owners and transporters look forward to tourists from Gujarat. Priyanka Chopra, the reel life M.C. 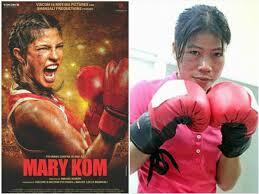 Mary Kom, is excited over real life boxing champion’s gold medal in the women’s flyweight category (48-51kg) at 17th Asian Games 2014 today. The actress feels it symbolises woman power.